Lead & Nickel Free!! 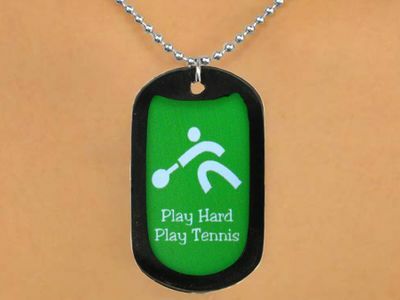 Silver Tone Ball Chain Suspends A Black-Trimmed Dog Tag With The Words, "Play Hard, Play Tennis" On A Green Background With A White Tennis Player. Scroll Down For Available Assortment!